Lori Lemaris searches for buried treasure, when she finds an amulet that grabs her. Cut to Metropolis, three weeks later. Lex Luthor stares over a converted Metropolis, now underwater, as mermen fight Superman in the "air." Lori Lemaris stands over Superman, his eyes glowing red, commanding him to kill the men. Superman refuses, but still manages to send them off. Luthor watches, and swears he's going to stop Superman. In Stryker's Island, Lois and Jimmy pull at the bars, trying to escape, when Luthor comes with telepathic blockers and sonic weapons. Superman questions his brainwashing. Lori tries to tell him to forget. King Shark attacks Metropolis, and Superman repels him. 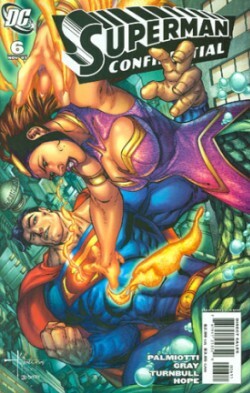 Lex and Lois and Jimmy attack the stronghold where Lori holds Superman in her thrall. Superman is given the order to kill them. Lex grabs Lois, kisses her, then snaps her neck, goading Superman to attack. Story - 2: This isn't really that bad of an idea, it's just not that incredibly compelling in the writing. It's rife with clichés, badly written dialogue, and unnecessary scenes. A lot like Countdown, which is why I wasn't surprised after reading the issue to look at the credits and see the guys responsible for Countdown working on this issue. Luthor: "I'm going to stop this, and I'm going to stop you, Superman." Luthor: Others may find your naivety charming, Mister Olsen, but I have a superior analytical mind." Nah, Luthor? Really? You know, Lex used to have some character. Now he's just a walking, spouting, joke ripped straight from the latter seventies and early eighties for the sake of nostalgia. That disgusts me. Lex has brown eyes AND blue eyes in this story, and his eyes are green. Lois has blue eyes, and her eyes are, or at least were, violet. I know Lois' change, so that's more forgivable, but Lex's are important and a continuity point. That's an art issue, though. Three pages wasted on the King Shark battle, unnecessary to the plot and for cool factor. Random guest appearances are not a forte of Countdown, are they? Oh wait, yeah, they are. I'm not going to ask how Metropolis is sunk under water, how the JLA doesn't see and react, etcetera, etcetera. That's thinking too much for this plot. "Editor's Note -- The conclusion to "Kryptonite" will be printed at a later date!" I've already rambled about that, but yeah. Unprofessional, crap, etc. I gave it a 2 because, all that aside, it was somewhat interesting in a few points. Lex snapping Lois' neck is an interesting, if quickly reversed dilemma. What irks me, mostly, is that the intent of this story is to explore Superman's origins, at least, that's as I understood it, and here we are with "NEW EARTH!" which is supposed to be interesting and explored through story, and yet here we are, years and years after Clark meets Lori, telling a story where Lori isn't even Lori, and where, honestly, there's no real difference between this story and a regular Superman issue. What distinguishes it? Still glad I'm borrowing this to review. And hey, "Welcome to Mer-Tropolis?" Seriously? Art - 4: A bit sloppy and exploitive in places, but mostly effective, largely in the action. The characters were a bit overdone, but the pacing, the paneling, and the scene were excellent. It read a lot like Danger Girl minus character tightness. I'm not afraid of a loose pencil, Bog's looseness rocks me, but this was just a little too loose in ways, like, say, when Lori is possessed or when Superman says, "Listen to your queen!" Still, great paneling, awesome action scenes, and a lot of good here. I think if the story weren't so stretched out, it would have rocked a lot more. Cover Art - 5: This cover really gives the impression that you're falling. It's hard to see in the preview online, but once you pick it up and take a look, it's really awesome. Superman's face is a bit contorted, but otherwise, solid colors, interesting pose, and a surprisingly good piece.